I am studying IOLI crackme0x02. It is clear to me that rewriting the jump at 0x8048451 with no instructions the crackme can be patched. However, I want to understand better what the code does. My problem is that I am unable to find where the entered password is located. I interpreted what radare2 is showing that there are 3 local variables. 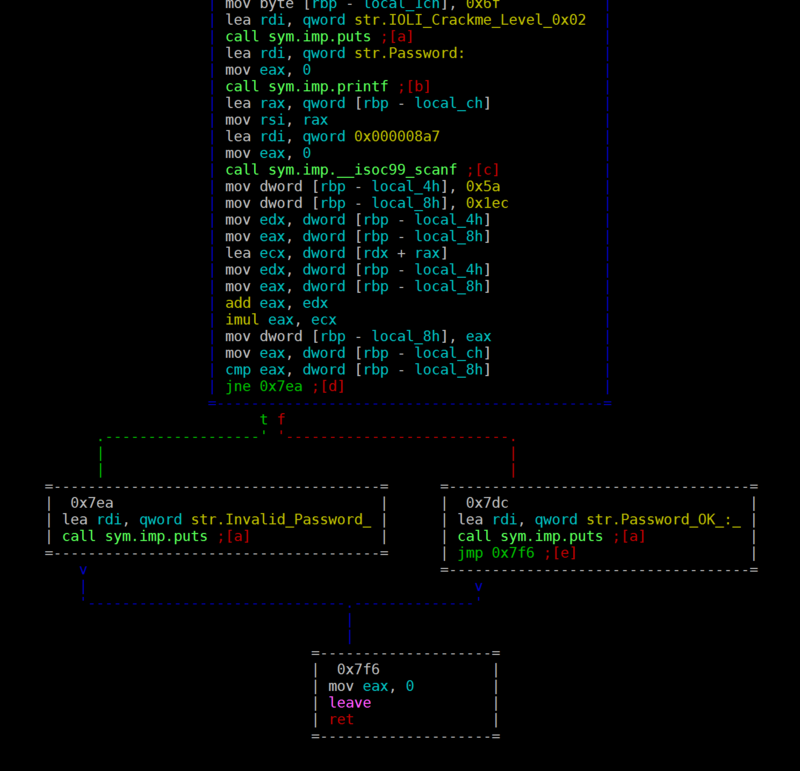 Since I am not yet familiar with radare2, I put a breakpoint in gdb after the scanf (0x0804842b), and inspected the local variables. It seems that neither they, neither the address they are pointing to are the password. Where is located the entered password? because in gdb x/4x usually prints 4 bytes. It's after the scanf() function it can get a bit confusing however I can explain this for you as I reversed this binary back to it's C code without the source. Here we can see values being "moved" into memory at the base pointer minus 0x8 and minus 0xc. Remember that the 'h' means hex and local means is just the hex value minus the value of ebp or the base pointer. ebp stands for Extended Base Pointer. Remember that computing something using registers is faster than computing it from memory so before each operation the compiler is going to try to move what it can into the registers to make it's calculations. We move ebp-0xc -> 0x1e into the edx register then we load the effective address (lea) of ebp-0x8 -> 0x5a. The add instruction adds the two values and saves them to [eax] which is now the same as a pointer to ebp-0x8 since it's saving it to memory we can assume we are replacing an existing variable with a new computed value because we move the value return from add to the same location in memory effectively overwriting it. You may not be familiar with the imul instruction but it simply multiplies two integers. We are multiplying the value of eax which is the return value of the add operation (582 or 90 + 492) then storing the value in eax overwriting it's previous value of 582. Thus we are executing (a + b) * (a + b) or 582 * 582. We then move the value you enter with scanf() from memory into eax and compare it to (a + b) * (a + b). If the jump afterwards is not equal to zero it will go to 0x8048461 showing invalid password otherwise it will jump to valid password. It will exit if the password is valid or invalid. Hope this helps and good luck with you reverse engineering journey! 0x804856c being the address of the format string (here, %d), and ebp-local_1 the offset where your result is stored. As for you x/4x issue, radare2 will print you 4 words, in hex, namely 0x00000000 0x08048330 0x00000000 0xf7e1a72e. Not the answer you're looking for? Browse other questions tagged gdb crackme radare2 or ask your own question.